Story profiles provide a simple overview of the story along with highlights and points of interest. The story summary is written for kids. When possible, we try to provide an approximate date for the event covered in the story. A printable PDF for this profile is available here and all related activities are listed here. 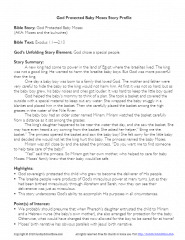 God’s Unfolding Story Element: God chose a special people. A new king had come to power in the land of Egypt where the Israelites lived. The king was not a good king. He wanted to harm the Israelite baby boys. But God was more powerful than the king. One day a baby boy was born to a family that loved God. The mother and father were very careful to hide the baby so the king would not harm him. At first it was not so hard, but as the baby boy grew, his baby noises and cries got louder. It was hard to keep the little boy quiet! God helped the baby’s mommy to think of a plan. She took a basket and covered the outside with a special material to keep out any water. She wrapped the baby snuggly in a blanket and placed him in the basket. Then she carefully placed the basket among the high grasses in the water of the Nile River. The baby boy had an older sister named Miriam. Miriam watched the basket carefully from a distance as it sat among the grasses. The king’s daughter happened to be near the water that day, and she saw the basket. She may have even heard a cry coming from the basket. She asked her helper,” Bring me the basket.” The princess opened the basket and saw the baby boy! She felt sorry for the little baby and decided she would not let the king hurt this baby. The princess named the baby Moses. “Yes!” said the princess. So Miriam got her own mother, who helped to care for baby Moses. Moses’ family knew that their baby would be safe. God sovereignly protected this child who grew to become the deliverer of His people. The Israelite people were products of God’s miraculous power at many turns. Just as they had been birthed miraculously through Abraham and Sarah, now they can see their deliverance was just as miraculous. This story underscores God’s ability to accomplish His purposes in all circumstances. We probably should presume that when Pharaoh’s daughter entrusted the child to Miriam and a Hebrew nurse (the baby’s own mother), she also arranged for protection for the baby. Otherwise, what would have changed that now allowed for the boy to be cared for at home? Moses’ birth narrative has obvious parallels with Jesus’ birth narrative. The Exodus probably occurred around 1446 B.C. (see notes below). According to Exodus 7:7, Moses was 80 when he first confronted Pharaoh, which means he was 80 or possibly 81 at the time of the Exodus, just a short time later. That means his birth would have occurred around 1526 B.C. (80 years earlier). See Walter C. Kaiser, Jr., EBC, p. 291. Compare with Bright, p. 123. We’ve chosen to go with an earlier date for the Exodus.